This client bridge can connect up to 15 Ethernet client devices running a legacy networking protocol to the WLAN – extending wireless network access to a wide range of protocols. An integrated serial to TCP/IP converter enables a RS-232 asynchronous terminal device to communicate with a compatible station on the network – providing the benefits of wireless mobility for devices like electronic cash registers, scales, servers, printers, medical equipment and other devices. Hardware-accelerated encryption provides higher performance when using WPA2/AES security. 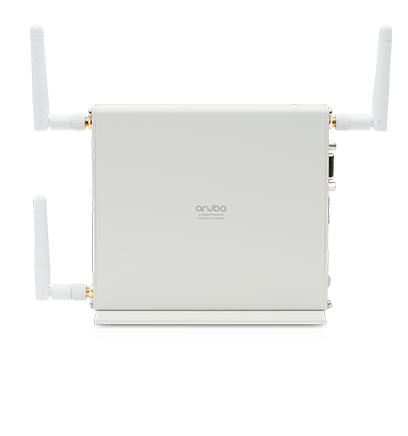 Integrated with Aruba’s Mobile First architecture, it supports deployments in a multi-vendor environment. With strong enterprise security features - you’ll be protected from network intrusions. Install in any location a WLAN signal is available – saving you time and expense.